(CNN) -- "Number nine. Number nine. Number nine." "The Beatles: Rock Band," to be released Wednesday, lets players strum along with classics. The repetitive refrain from one of The Beatles' most mind-bending journeys into psychedelia -- "Revolution 9," the audio pastiche from "The White Album" -- is now serving as the backbeat of a big day for the biggest band in rock 'n' roll history. On Wednesday -- 9/9/09 -- remastered versions of the Beatles catalogue will be released, giving listeners what the remaining members of "The Fab Four" say is the closest reproduction ever of how their music sounded in the studio. 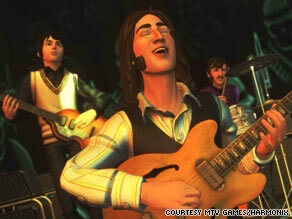 The same day, the video game "The Beatles: Rock Band" is set to be released by Harmonix. Modeled after the already popular "Rock Band" game, and closely supervised by The Beatles and their estates, the game lets players sing and strum along on a huge list of Beatles classics over scenes ranging from Liverpool's Cavern Club to their final performance on a London rooftop. And on top of that, there's rampant speculation that a planned "music-themed" announcement by Apple Inc., also scheduled on 9/9/09, could involve the supergroup. The Beatles are one of a handful of groups whose music has never been approved for sale by Apple's iTunes, and the timing of the announcement has fueled speculation that could finally change -- or even that specialized Beatles iPods, like the ones sold in 2004 loaded with U2's music, could be in the works. It's a remarkable amount of buzz for a band whose roots stretch back nearly five decades. And it's a clear sign, observers say, that through time and a multitude of cultural shifts, the group's hold on the public's imagination has endured. "People are still looking at Picasso. People are still looking at artists who broke through the constraints of their time period to come up with something that was unique and original," said Robert Greenfield, a former associate editor at Rolling Stone magazine who has written about the band. "In the form that they worked in, in the form of popular music, no one will ever be more revolutionary, more creative and more distinctive than The Beatles were." Research shows that more than 40 years after their last public performance, Paul McCartney, John Lennon, George Harrison and Ringo Starr's music remains as interesting to young people now as it ever was. A Pew Research survey released last month showed that 81 percent of respondents between ages 16-29 said they liked The Beatles. Eleven percent said they dislike the band and only 4 percent said they have never heard of them. By comparison, current rockers Coldplay received 39 percent positive responses, with 45 percent saying they'd never heard of them. Forty-two percent said they like hip-hop star Kanye West. "To put this in perspective: Try imagining young adults back in the 1960s putting the big jazz bands of the roaring '20s at the top of their list of favorites," the survey reads. "Not very likely." Walter Everett, professor and chairman of music theory at the University of Michigan, said his students know The Beatles catalogue as well today as they would have 30 years ago. He said the cultural phenomenon that was The Beatles -- the frenzy-inducing early concerts, the furor when John Lennon said the group was "more popular than Jesus," the pre-Internet obsession over "Paul is dead" rumors -- made them something more than just another rock group. "They were just idolized," said Everett, who has written several books on the band. "It was a musical revolution, but [also] the hair, the clothing, their attitude about the establishment, their support of everybody, young and old alike, to try to understand each other at a very difficult time. "Some of that message endures." But at the heart of the phenomenon, experts agree, is the music. From the charming, school-boy bop of "I Want To Hold Your Hand" to the blistering assault of "Helter Skelter," the songs, they say, were just that good. "The point is how great the music is," Greenfield said. "It isn't about the fact that The Beatles were willing to practice and get better at what they did -- it was the fact that that band contained at least two-and-a-half geniuses [Lennon, McCartney and, at times, Harrison]." Wednesday's announcements -- and, in Apple's case, possible announcement -- show that the minders of The Beatles legacy are keeping up with how today's music consumers behave, said Bruce Burch, director of the University of Georgia's music business program. "A lot of bands and artists have been slow to embrace the fact that technology is driving the industry," Burch said. "Their music is not going away and this is a step for them for their music to come into the 21st century." EMI, which will be releasing the remastered recordings, has been famously protective of The Beatles brand and music. Digital reproductions like MP3s have lower sound quality than albums or compact discs -- one of the reasons they've been slow to embrace iTunes. But if an announcement on that front is coming, Burch said, it would signal an acknowledgement that such quality-control concerns may be obsolete for the majority of the music-buying public. "It's just a different audience out there," he said. "They're used to listening on ear buds. The sound quality, in some cases, maybe isn't' as important to them." Everett said that, even with all of the news expected Wednesday, the Beatles music will no doubt remain popular for decades to come -- meaning more new wrinkles are almost certain. "There's still more that can be done," he said. "Who knows where technology may be in another 10 years? We may have holographic images." And regardless of how it's delivered, no one's expecting another band to ever eclipse the four lads from Liverpool who would go on to shape popular culture the world over. "There will probably be another artist that comes along and captures the imagination," Burch said. "But it will never be like The Beatles."